A cymbal can crack if you don’t play it correctly. By choosing the ‘right’ cymbal weight, size, and positioning, you immediately reduce the possibility of cracking. Play the right cymbals. Every cymbal has its strengths and limitations. Hitting a smaller or thinner cymbal harder and harder to get a bigger sound or make it louder isn’t the answer. It wasn’t designed to be so loud. So don’t use small, thin cymbals for high-volume, hard-hitting playing (unless you want a contrast in your set-up… but don’t hit them as hard as the rest.) For volume, power and durability, choose bigger and heavier models. And consider the brighter sounding series, like AA, AAX, PRO and Sonix®. Their sounds are higher pitched and more effective at cutting through a loud band. Lower pitched series, like Hand Hammered and HHX, also offer models suitable for powering any style of music. Do not over-tighten the cymbal. A cymbal must be free to vibrate. Vibrations are what generate sound in the metal. The looser the cymbal, the better the sound. Tightening it will kill that sound… choking it the same way as if it was being held, or dampening it in much the same way as a piece of tape. If the cymbal isn’t free to move, then the pressure of your playing creates stress in the metal and that can create cracking. Cracking due to over-tightening usually happens around the base of the bell or straight in from the edge. Do not over-angle crash cymbals. These cymbals should be positioned fairly flat and angled only slightly toward you, so your stick can slice across their edge. A cymbal that is angled too steeply is restricted from moving freely and it will suffer the same stress as if it were bolted down too tight. This will restrict the sound and can lead to cracking. > Don’t hit directly into the edge. If you are ‘chewing up’ your sticks when playing your crashes you may be hitting directly into the edge. When you direct-hit the edge of the cymbal, you are pushing the stick into it. This not only hurts the edge (and your stick), it reduces the response of the cymbal… choking it somewhat. Heavy hitting like this may cause the cymbal to vibrate uncontrollably, for a less than perfect sound. If you must do the occasional direct hit, strike and pull back quickly. Like touching something hot, pulling a punch, or snapping a towel. > Do you slice your stick across the edge in a sweeping motion? A glancing blow activates the cymbal and lets it vibrate freely because the stick is on and off the cymbal before it vibrates. This sweep-stroke will give you the best sound. It will also create a ‘flow motion’ that will bring your stick back into play faster and more smoothly, so you’ll be playing better. Protect Your Cymbals. Your cymbals are in danger once they are off their stands. They can get knocked over and their edges damaged if you lean them against your stands or other objects while ‘tearing down’ your kit (a small nick on the edge can grow to become a major crack!). Other band members can step on them if they’re lying on the floor. Avoid these dangers by putting them directly into a quality cymbal bag or hard-shell cymbal case. 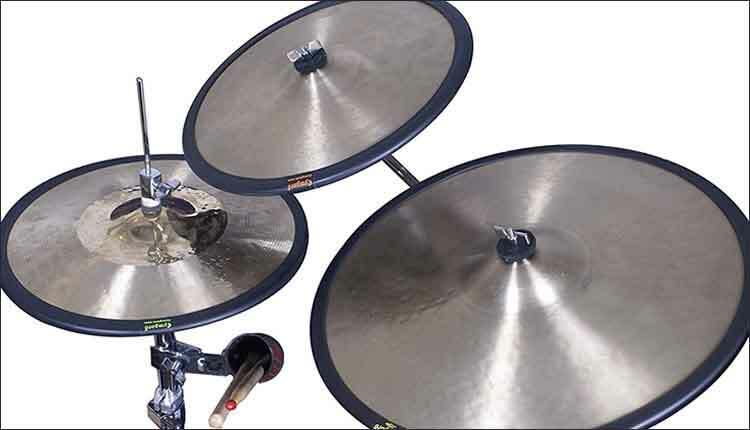 Inserting dividers between the cymbals in the case will prevent metal-to-metal contact. Pieces of cloth, inexpensive kitchen towels (also good for wiping the cymbals clean after playing), or the original plastic bags the cymbals came in, are some options. Always stack cymbals so smaller models fit into larger models.